Thorstein Bunde Veblen (July 30, 1857 – August 3, 1929) was an American economist and sociologist of Norwegian origins and head of the Efficiency Movement, most famous for his Theory of the Leisure Class (1899). In this work he introduced the theory of conspicuous consumption. Thorstein Veblen believed that all social institutions are important to study for understanding the economic issues as the economy could not be isolated from the other institutions. 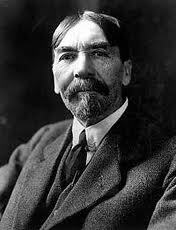 Thorstein Veblen gave us terms like “conspicuous consumption” and “pecuniary emulation”. He was one of the truly great mavericks in economic thought and the late J.K. Galbraith sought to carry on the tradition. Today universities would not hire the scruffy Veblen, who was a philanderer and graded all his students with a C.
It was a different matter when the iconoclast turned his mind to economic vision. Veblen wanted economists to grasp the effects of social and cultural change on economic changes. In his greatest work The Theory of the Leisure Class Veblen took a satiric look at 19th century American society and showed how pecuniary or money- related emulation played a crucial role in consumer behavior. Veblen was professor at Stanford University from 1906 to 1909, Missouri University from 1911 to 1918 and the New School for Social Research, New York, 1918-1922. Veblen originality of thinking, his critical analysis of American society and culture, and his personal character, made him an outsider in American universities. 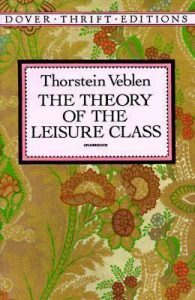 Veblen’s most important books are The Theory of the Leisure Class (1899) and The Theory of Business Enterprise (1904), later including The Instincts of Workmanship and the State of the Industrial Arts (1914) and Absentee Ownership (1923). Veblen stood initially critical of the traditional economics taught in universities, which he saw as too individualized and static, but he was also an opponent of the Marxist doctrine that history is moving towards a Utopian goal. As early as 1896 he worked to transform the economics of a “science of financial institutions ‘development’, thus becoming one of the authors of the institutionalized great school in the U.S. economy. Veblen would place greater emphasis on institutions and collective phenomena. Sociology and anthropology were necessary sciences to understand the economy. The tradition in the form of inherited values in shaping the economy, and this tradition can be contrary to the scientific, instrumental aspects of the economy. Veblen pointed a sharp criticism of the contemporary American market economy, which withdrew from the production title. Thus ports might of a greedy manager class, the leisure class (“the off-duty Class”), which devours society riches and mimic each other in status hunting. Veblen term for the latter phenomenon, conspicuous consumption has entered the English language as a usual expression. Veblen was one of the pioneers in the study of consumer behavior and behavioral economics.